Catalogs serve several important function in the stamp hobby. They serve as a reference system because the catalogs assign numbers to the various stamps, and these numbers are how collectors often refer to the stamps. Secondly the catalogs assign value to the stamps, which is often highly inflated, but does serve as a benchmark for the value. In todays market the actual cash worth of a stamp is probably going to be a small fraction of the catalog value. Lastly catalogs serve as reference tools, providing pictures and technical descriptions of the thousands of stamps issued by the dozens of countries in the world. The king of catalogues in the United States and much of the world is Scott. 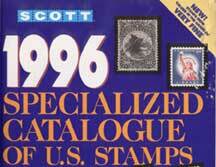 The Scott stamp catalogs cover not only American issues, but the issues of the entire world. Other countries are dominated by domestic catalogues with their own numbering systems. In Great Brittain the Stanley Gibbon’s catalogue is popular, in Germany; Mikel. An excellent guide for the beginner, the Postal Service Guide to U.S. Stamps is a nice reference book. It features color photos of the various issues, uses the Scott numbering system, is reasonbly priced and can be purchased at any Post Office.